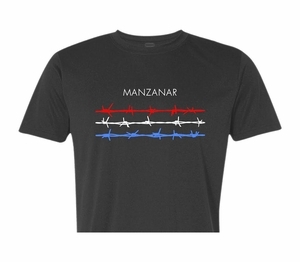 Manzanar Barbwire T-Shirt This new item was designed by award-winning designer Bob Matsumoto. Matsumoto, whose advertising work is in the permanent collection at the Museum of Modern Art, was incarcerated at Manzanar as a child. He also created the iconic Remembrance poster. The T-shirt comes in Heather Charcoal (60% cotton/40% polyester). Adult sizes S, M, L, XL, 2XL. "It's a tribute for the incarceration of 120,000 Japanese Americans. It's a symbol of the loss of freedom and dignity we suffered. It's a bold reminder of our history.